The faith of Afrin, Syria’s northwestern corner, remains in the balance. The Kurdish militia, YPG, has struck a deal with the Syrian Arab Army (SAA) to enter Afrin, in a bid to deter and counter further Turkish advancements. Reports claim that SAA elements have already entered Afrin canton and are establishing outposts. 1. 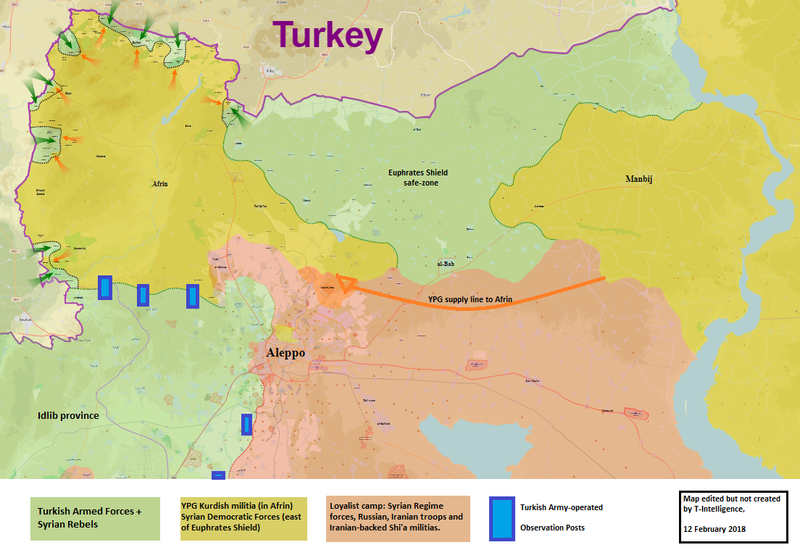 Just a month ago, the Turkish Armed Forces (TSK) and embedded Syrian Rebel groups have launched Operation Olive Branch with the objective of ousting the Kurds from Syria’s northwestern corner. This incursion was facilitated by the retreatment of the Russian military policemen stationed in Afrin’s airfield, in exchange of the Turkish cooperation of de-escalating Idlib province for the Loyalist offensive that was ongoing at that time. With both parties not keeping they’re side of the deal in the end, Idlb’s limits began to be fortified by Turkish Army observations posts and likewise, Russia closed the airspace for the Turkish jets over Afrin. With littile advances made on Syrian-Turkish borderlands, the Kurds engaged in a multilateral diplomacy with several parties involved in the war. 2. Afrin is not in the U.S.-led Coalition’s operational interest or reach, and Washington has been attempting to revigorated the strategic partnership with Turkey after years of degradation caused by U.S. assistance to Kurdish forces. While U.S. troops are stationed in Manbij, east of Turkey’s “Euphrates Shield” safe-zone, they will not allocate deterring force for Afrin. Russia has already pulled-out, with no plans of re-deployment. The Syrian Forces remained more concerned regarding the Turkish intervention invoking sovereignty infringement and fearing that the territory will be de facto annexed or controlled by Ankara through a micro-governance of Rebel parties – as occurring in the Euphrates Shield area. 3. A similar partnership was struck in late-March 2017. When following the end of the joint Turkish-Opposition operation “Euphrates Shield” culminated with a pyrrhic victory over ISIS in al-Bab, Ankara was eyeing the YPG-led SDF (Syrian Democratic Forces) in Manbij. In response, U.S. troops were detached to parade with the national flag and send a message of deterrence to their NATO ally. in addition, the Kurds also sought help from Damascus – which detached several forces near the Turkish positions in south-eastern al-Bab and cutting their frontline with ISIS at that time. 5. Several days ago, the Kurds backed by the U.S. repealed a massive assault of the Russian-private contractor, Wagner Group and Syrian forces in the mid-Euphrates valley, resulting in hundreds of casualties for the Russian mercenaries. In northwestern Syria, the same Kurdish forces are accommodating Syrian troops as a deterrence measure against the Turks. Overall, the Kurds and the Assad government have divergent views over the future of Syria, but have traditionally avoided direct confrontations, with the exceptions of several isolated episodes. As of now, pro-governmental troops are ready to enter Afrin – a deal certified as 100% sure by Syrian media. 4. Operation Olive Branch forces have reportedly shelled the northern vicinity of the Nubl and Zahra villages in Aleppo, attempting to deter Syrian forces from crossing into Afrin. Kurdish volunteers from Aleppo city have also traveled to enforce YPG defensive positions within the canton. 6. The deployment of Syrian Arab Army (SAA) forces into Afrin will have deterring effects on the Turkish-Rebel coalition, likely forcing them to halt operations in the region’s core – border securing efforts might still continue without targeting Afrin city or other large settlements. However, Ankara will respond by re-escalating the situation in Idlib. Not only will Opposition forces return to that front better armed and supplied, the battlefield itself will be more difficult. 7. It is widely known that Hay’at Tahrir al-Sham (HTS) is the un-official affiliate of al-Qa’ida in Syria. However, a new faction emerged which claims direct affiliation with the Salafist terror group. Jaysh al-Malaheem was formed in late-2017 following mass defections from the HTS after the former had a public break-up with AQ; but has grown as media footprint online. The Turkistan Islamic Party is another hardline jihadist group with direct links to AQ, and significant resources on the ground. Most of their recruits are battle-hardened Uygurs that fought against Chinese forces in the Xinjiang Islamic insurgency and participated in the the Afghan “jihad”. 8. In mid-February, HTS’s main competitor and old-traditional ally, Ahrar ash-Sham has merged with the Free Syrian Army-affiliate, Noor al-Din al-Zenki to form a new front – Jabhat Tahrir Souriya (the Front for the Liberation of Syria). This re-flamed the old tensions between Ahrar and HTS and brought the new Opposition coalition into direct confrontation with the jihadists in western Aleppo and south-eastern Idlib. 9. The developments in Afrin and Idlib are natural response, and sequel to the deadlock reached between Turkey and the Loyalists regarding the previous failed deal. 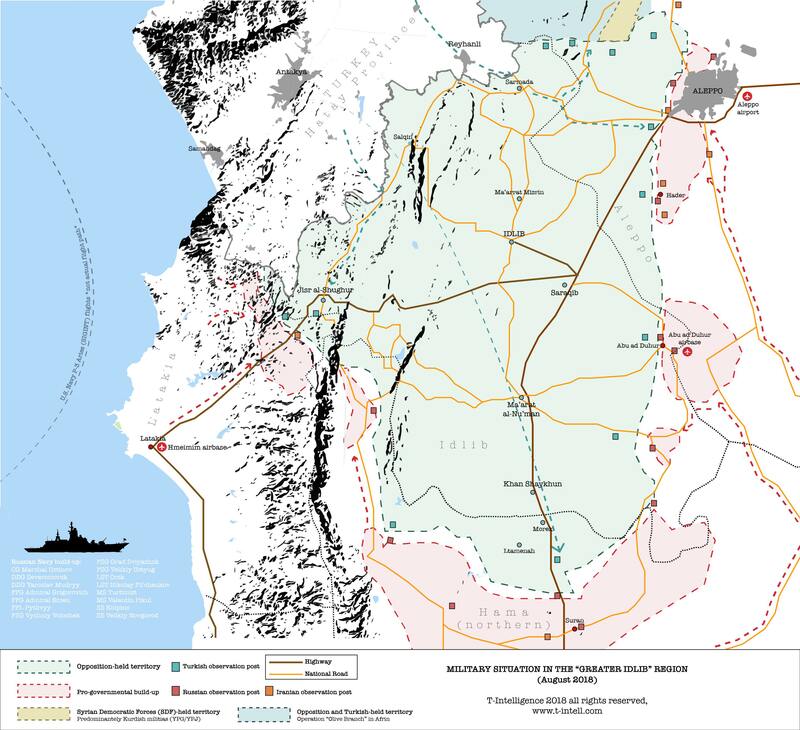 The re-escalation of tensions in Idlib, and the Syrian-blockade over Afrin provides new incentives to negotiate an additional, improved deal between the Astana signatory-actors. If that does not occur, chances are that the Syrian regime forces will remain and annex Afrin canton from the Kurds themselves.